Guana Tolomato and Matanzas Rivers Florida Forever Project. The Northeast Florida Blueway Phase II ("Blue II") project boundary was designated as a Category A project by Acquisition and Restoration Council (ARC) in 2001. Projects that are ranked as Category A projects are eligible for 100% state funding. This proposal included undeveloped lands on the east and west sides of the Intracoastal Waterway through St. Johns County. Within the "Blue II" project boundary area there is approximately 18,170 acres (1413 parcels) of private lands and 9985 acres (259 parcels) in public ownership. Public ownership within the "Blue II" project boundary reflects the natural, ecological integrity and historic value of the region. Specifically the public lands are owned by various federal, state and local agencies such as, but not limited to, United States Department of Interior National Park Service, Department of Environmental Protection (DEP), St.Johns River Water Management District (SJRWMD), Division of Forestry (DOF) and St. Johns County. These federal, state and local parks including, but are not limited to, National Monuments (Castillo de San Marcos and Ft. Matanzas), State Parks (Guana Tolomato Matanzas National Estuarine Research Reserve, Anastasia Island State Park, Favor Dykes, Frank Butler Beach Park (east and west) and Pellicer Creek Aquatic Preserve (one of the state´s 38 designated recreational canoe trails), SJRWMD Acquisitions (Stokes Landing and Moses Creek Conservation Areas), Aquatic Preserve (Guana River Marsh), Deep Creek State Forest, Ft. Mose, Wildlife Management Area (Guana River Wildlife Management Area) and Local Parks/Cultural amenities (Mickler Landing, South Ponte Vedra, North Shores Park, Surf Side Park, Vilano Beach Fishing Pier, Vilano Boat Ramp, Fountain of Youth, S.R. A1A Amphitheatre, Davenport Park, Lighthouse Park/Museum, St. Johns County Fishing Pier, Crescent Beach Park, Southeast Intracoastal Waterway Park, Matanzas Inlet Fishing Bridge and Rattlesnake Island Park). Rich in eco-system diversity this approved project boundary was identified for future acquisitions and contains 17 types of natural communities possibly supporting 70 or more Florida Natural Areas Inventory (FNAI) listed species and this boundary is recognized by the Fish and Wildlife Conservation Commission´s (FWCC) Strategic Habitat Conservation Areas (SHCA) map. Through this program the ecological integrity of this area will be protected. In addition, this area is rich in historical and archaeological resources due to the Native Americans and European inhabitants spanning over a wide period of time as identified by the Division of Historical Resources Master Site Files. The acquisition and protection of the remaining uplands will help ensure this area continues to provide a quality outdoor experience such as boating, canoeing, kayaking, birding, picnicking, hiking, dirt biking, horseback riding, fishing as well as environmental and historical/archaeological interpretative education (through signage). 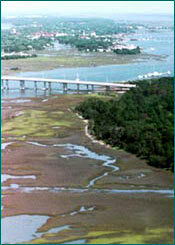 On April 2003 that state acquired the largest tract of land within the "Blue II" project boundary area previously known as the Rayonier Tract and now referred to as the Matanzas Marsh. This tract is located between SR 206 and the St. Johns/ Flagler County boundary line and lies between US 1 and the Intracoastal Waterway. The Matanzas Marsh Tract is the largest parcel of land located within the designated Northeast Florida Blueway Phase II — Guana Tolomato Matanzas Rivers and is total of 8,465 acre. This parcel of land protects five miles of Intracoastal Waterway lying adjacent to Class II Shellfish Harvesting waters and creates 16,000 acres of contiguous conservation land between Moses Creek Conservation Area and Princess Place Preserve. This parcel of land protects four tributaries that directly contribute to the Matanzas River and one tributary that flows into the Outstanding Florida Waters (OFW) of Pellicer Creek Aquatic and Faver-Dykes State Park Preserve. There are 12 types of natural communities and more than 30 state and federally listed species. Using the Florida Natural Areas Inventory classification scheme, the following natural communities occur on the site: maritime hammock, sand pine scrub, scrubby flatwoods, pine flatwoods, sandhill, upland mixed forest, baygall, depression marsh, dome (cypress), floodplain swamp, blackwater stream, estuarine tidal marsh, and estuarine unconsolidated substrate (tidal flat). A large portion of the property is in silviculture (mostly slash pine). The significant wildlife resources include, but are not limited to, two eagle nests, large wood stork colony, breeding painted buntings and large aggregations of wading and shorebirds foraging in the freshwater and estuarine wetlands. In addition there are five documented cultural sites exist on the property (Master Site Files SJ3152-3156). Probably two others could be added. The sites are all pre-historic St. Johns Culture (and possibly earlier) and several contain historic components. There also at least 5 documented farms, or plantations that utilized the site during the Second Spanish and Territorial Periods. This site was acquired with Florida Forever and St. Johns River Water Management District funds. The Department of Environmental Protection (DEP), Division of Recreation and the Division of Forestry each manage fifty percent of this tract.